The San Diego Archaeological Center houses many prehistoric and historic collections from San Diego County adjacent regions. The Center provides state and federally approved curation facilities for archaeological collections and related archival documentation that is mandated by various pieces of federal legislation and regulation 36 CFR Part 79. The Center is equipped with over 5000 square feet of vault space that allow us to provide long-term curation and care for a wide range of archaeological materials, including artifacts, ecofacts, maps, photographs, and site records. Our curation facility meets or exceeds standards established in regulation 36 CFR Part 79. In addition, we partner with local colleges and universities to provide a setting for volunteers and students interested in archaeology to gain hands-on experience working with archaeological collections. The SDAC has a diverse staff of professionals and technical support personnel. Our experienced staff has expertise in local, regional, and national collections management policies and practices. A certain degree of standardization in collection preparation, cataloging, packaging and organization is necessary in order to preserve collections, facilitate future research and maintain inventory control. It is not the goal of the San Diego Archaeological Center to dictate research design, field methodology or laboratory procedures to cultural resource management companies, but to work hand-in-hand with procedures already in practice while meeting the above standards. The following publications are available from the San Diego Archaeological Center by mail, fax or email (Microsoft Word format). Please indicate your preference in your request. The Center maintains archaeological collections in accordance with “The Curation of Federally-Owned and Administered Archaeological Collections” (36 CFR Part 79), State of California Resources Agency’s 1993 Guidelines for the Curation of Archaeological Collections, the National Park Service Museum Handbook, Part I, Museum Collections, culturally-affiliated American Indian and cultural group advice, professional museum and archival practices and any other relevant and appropriate recommendations as to the care of archaeological collections and archives in order to prevent degradation of collections by human or environmental factors. View a detailed listing of Curatorial and Exhibition services. The Center has a strict policy when accessioning new collections or entering into curation contracts. New collections delivered to the Center must contain a site report, master catalog, information about inadvertent discoveries, a list of deaccessioned items with supplementary documentation, and conveyance documents. View instructions on Collection Preparation Guidelines 2019, which contains everything you need to know to make your archaeological collections curation-ready. Curation Supplies: The San Diego Archaeological Center has archival-quality supplies available for purchase. We are able to purchase many items in large quantities and are happy to pass the cost savings on to you. Please let us know if there are any additional items you would like us to carry. Download the Curation Supply form. The Center has a strict policy when accessioning new collections or entering into curation contracts. New collections delivered to the Center must contain a site report, master catalogue, information about inadvertent discoveries, a list of deaccessioned items with supplementary documentation, and conveyance documents. Accession Agreement– Use this form when you are submitting a collection for curation and the owner is transferring ownership to the Center. Curation Agreement– Use this form when the collection owner is retaining ownership of the collection. Transfer Agreement – Use this form when the collection is from a Federal or governmental agency. Receipt of Collections– Print this form on your company letterhead and include it with your collection upon delivery. A listing of vendors providing archival-quality curation products at reasonable prices. Over the years, millions of archaeological artifacts have been recovered from public and private lands in San Diego. However, the vast majority of these artifacts were still, in effect, underground. 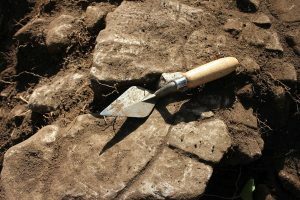 Boxes and bags of archaeological artifacts were scattered among private cultural resource management (CRM) companies, public institutions and government agencies throughout San Diego – a true curation crisis. The San Diego Archaeological Center, the first nonprofit, private organization dedicated to the care, management and use of archaeological artifacts, is attempting to restore these collections to cultural resource status. Our vision is to sustain an archaeological center in San Diego where artifacts will not only be cared for in a state-of-the-art environment, but where further professional research can commence and the public can enjoy learning about the prehistory and history of the San Diego region through educational programs and museum quality exhibits. Since opening our doors in 1998, the Center has become a nationally recognized leader in the curation of archaeological collections. The Center has played an important part in the development of the concept of curation and the advancement of the discipline at a local and national level. Our “claim to fame” is that we return archaeological collections to the public as a cultural resource that they can understand, appreciate and value. Why Is Curation Important? Curation comes from the Latin word cura, meaning care. We define curation as the CARE, MANAGEMENT and USE of archaeological collections. Care means that you prevent deterioration, management means that collections are organized and accessible, and use means that you use collections for scientific research, public education or cultural use. Respect: Curation is basically a matter of respect. Respect for the cultures represented in the collections, respect for ourselves and future generations and respect for the millions of dollars spent on the identification and retrieval of cultural resources. Research: Curated collections will be available for the next generation of investigative technologies. Collections gathered just ten years ago, deserve another look with up-to-date tools and research models. Mitigation: Curation after excavation is the only way to appropriately mitigate the negative impact of development or academic research on cultural resources. The laws and guidelines that have been enacted to protect cultural resources all contain a component of time, artifacts are supposed to be preserved for the future. For more information about SDAC Collections, contact Jessica McPheters, Collections Manager at jmcpheters@sandiegoarchaeology.org.